Buckle up, Twin Cities. We are now less than one month away from the Super Bowl. Roads around U.S. Bank Stadium are already closed — with more on the way. Metro Transit has posted what you need to know on Super Bowl detours and extra train and bus services. Volunteers have gotten their assignments. Here's a look at what you can expect each week until the big game. Finally, we've found out who's playing in the Super Bowl, after Sunday's the conference championships on Jan. 21: After the Vikings' loss to the Philadelphia Eagles Sunday, the Eagles will take on the New England Patriots at U.S. Bank Stadium on Feb. 4. Meanwhile, downtown: A section of Second Avenue and Grant Street directly in front of the Minneapolis Convention Center will be closed to everyone but permit-holders beginning Jan. 24. The closure is scheduled to run through Feb. 7. The road will be closed because the Convention Center is hosting the Super Bowl Experience, a ticketed NFL interactive theme park that opens Jan. 26. Expect intermittent road closures immediately around the area for the duration of the event. 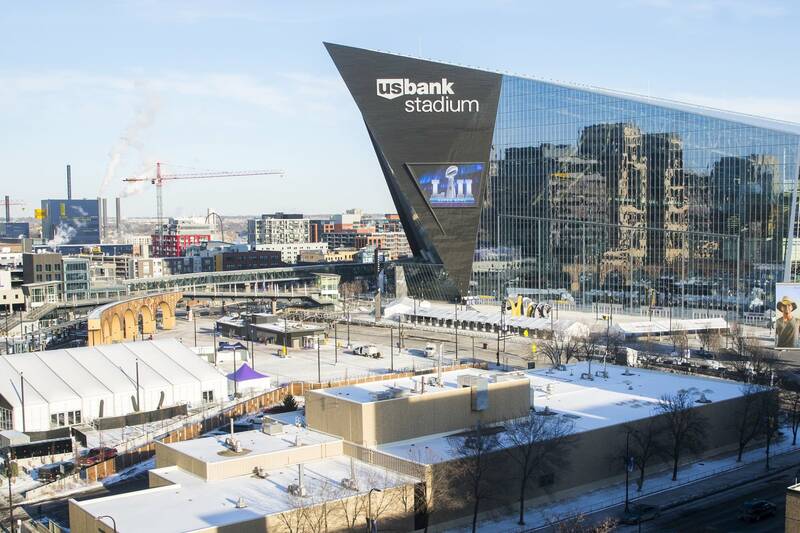 Super Bowl LIVE, the 10-day free fan festival featuring — among other things — live music, a skating rink and 198-foot-long Birkebeiner bridge, opens Jan. 26. Along with that opening, expect lane restrictions from Sixth Street to 12th Street through game day. The long-awaited Kitten Bowl launches Friday, Jan. 26, and will run through Super Bowl Sunday. The Kitten Bowl will be open for in-person visitors inside the Dayton Building along downtown Minneapolis' Nicollet Mall, and will be broadcast live on the Hallmark Channel starting at 11 a.m. Central on Super Bowl Sunday. And if you live near the Minneapolis-St. Paul International airport, be aware that the city of Burnsville is warning residents about a likely increase in airport noise starting Saturday, Jan. 27, and running through Tuesday, Feb. 6. On Monday, Jan. 29, the NFL Network kicks off its daily Super Bowl coverage from Minnesota. Also on Monday, St. Paul's Xcel Energy Center plays host to the Super Bowl Opening Night event at 7 p.m. Central. It's the Super Bowl's media night, which will be televised, but is also a ticketed event that's open to the public. Avoid the light rail lines if you're: a) not going to the game and b) need to get around town. Only those with an official Super Bowl ticket and a $30 game-day LRT pass will be able to board the Blue Line at the Mall of America or the Green Line at Stadium Village, and only after clearing security. The Green Line will operate normally between Stadium Village and Union Depot stations on game day. For everyone else, buses will replace trains on the entirety of the Blue Line through the day. Free buses will also run between the Target Field and Stadium Village stations on the Green Line. And now it's time for everyone to go home. MSP airport spokesperson Patrick Hogan says the airport expects to set a record that day. Eight teams battled for the NFL playoff wild card spots this weekend, and now the lineup is complete: Next weekend, the league's two conferences — the American Football Conference and the National Football Conferences — will play their divisional rounds, the winners of which will head to the conference championships. In the AFC wild card round, the Tennessee Titans beat the Kansas City Chiefs, 22-21, and the Jacksonville Jaguars beat the Buffalo Bills, 10-3. In the NFC's wild card games, the Atlanta Falcons beat the Los Angeles Rams, 26-13, and the New Orleans Saints beat the Carolina Panthers, 31-26. This weekend, the divisional round. The Vikings will take on the Saints Jan. 14 in Minneapolis. The Saints were the highest-winning seed from the NFC's wild card round. If the Vikings win, they move on to the conference championships next week. They'll play the winner of Jan. 13's game between the Atlanta Falcons and the Philadelphia Eagles. For the AFC, the New England Patriots will host the Tennessee Titans on Jan. 13 and the Pittsburgh Steelers host the Jacksonville Jaguars on Jan. 14. The winners of those games will meet the following weekend in the conference championships. Also this week: Nicollet Mall closes from Sixth Street to 12th Street, beginning Jan. 15 and continuing through Feb. 7 for Super Bowl LIVE. Technically, the fan festival doesn't open until Jan. 26, but crews will need the additional time for setup and teardown. Pedestrian access and sidewalks will remain open during the event.